If you want to expand the ontology, you can add a new concept that represents an entirely new clinical meaning, or refines the meaning of an existing concept with new descriptions or relationships. You are only allowed to edit a concept's core properties like status and definition status, its descriptions and source relationships. Destination relationships and reference set memberships are read only; you can use the reference set editors to add and remove reference set members. Editing is strongly limited for released components; the limitations will be described in more detail in the rest of this section. Snow Owl provides full support for a concept model, which dramatically simplifies editing. When creating a new concept the valid relationships and description types for the concept are displayed in a form editor, so you simply have to enter any missing information. 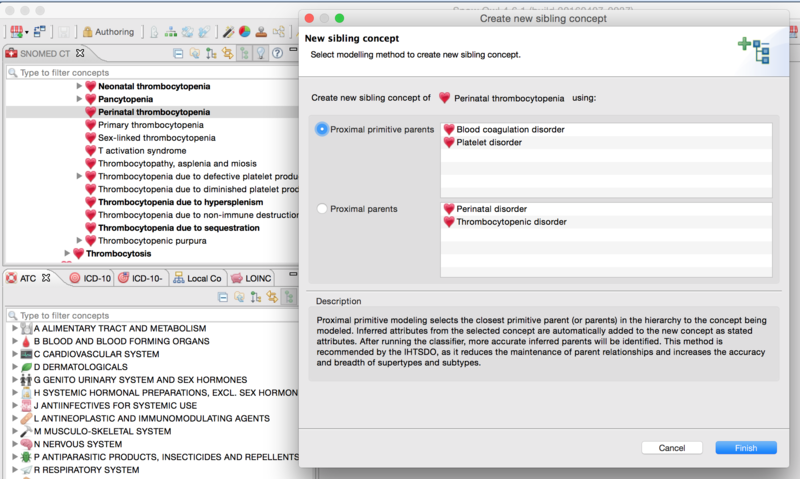 Snow Owl enables selecting the preferred modeling method by using either the proximal parent, or the proximal primitive supertype for concept authoring. Proximal primitive parent model selects the closest primitive parent (or parents) in the hierarchy to the concept being modeled. By using this modeling method, inferred attributes from the selected concept are automatically added to the new concept as stated attributes. After running the classifier, more accurate inferred parents will be indentified. This method is recommended by the IHTSDO, as it reduces the maintenance of parent relationships and increases the accuracy and breadth of supertypes and subtypes. The other modeling method is Proximal parent (or parents) - here the direct parent is used, regardless of its definition status. Attributes are not copied over to the new concept, as the classifier will inherit them as needed. Both modeling options are available when creating a new child or sibling concept. After selecting the modeling option and finishing the wizard, the new concept's editor is shown to allow modifications to the descriptions and attributes. Before starting to model the new meaning, you need to decide where you want to place it in the hierarchy. 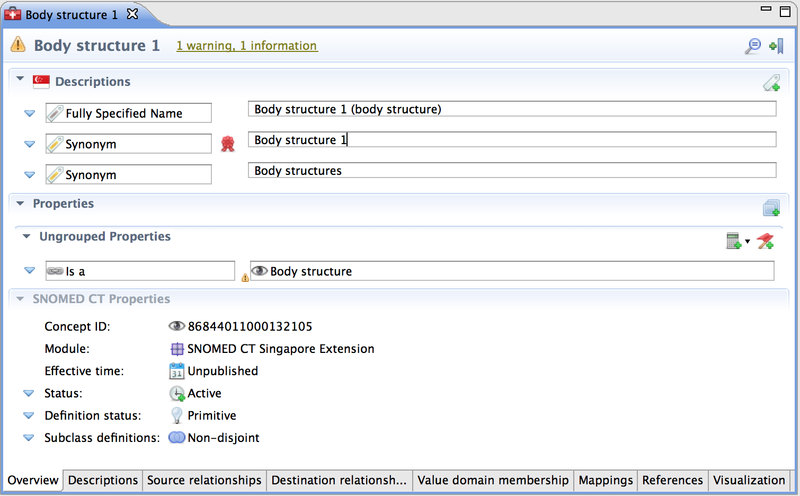 Once you have established that, you can start creating the new concept directly from the SNOMED CT Concepts view. 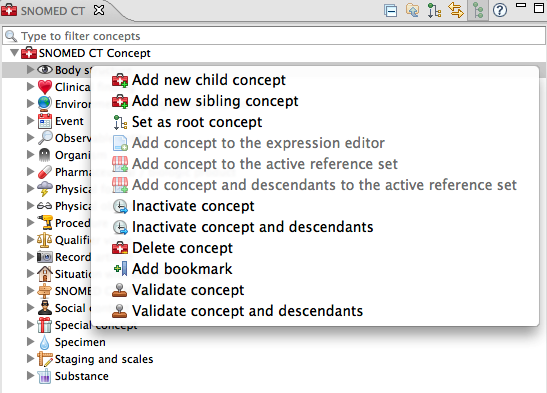 Right-click on the desired parent concept and selecting Add new child concept. An editor for the new concept is opened after selecting the Modeling method. 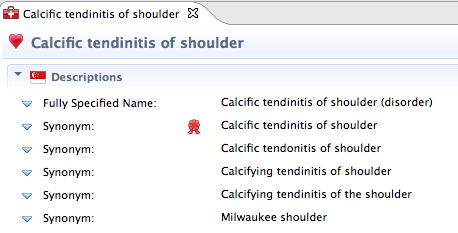 This action creates a child of the selected concept with identical SNOMED CT descriptions. This way, only differing information has to be entered in the editor. 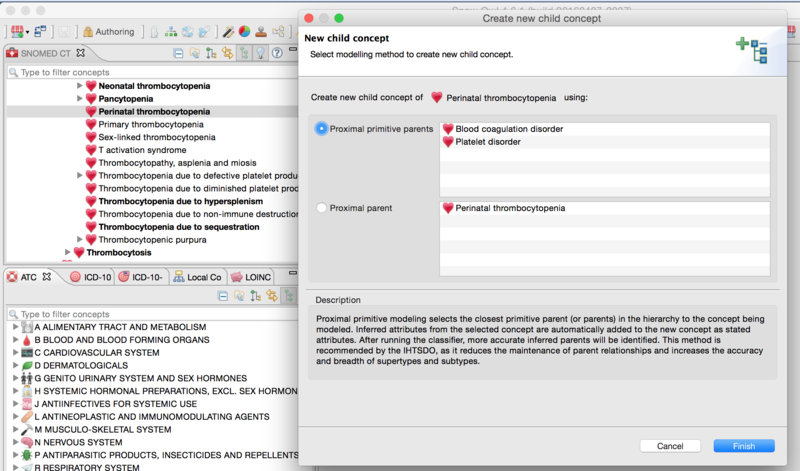 For the new concept, an IS A relationship to the parent concept is generated as well as unique concept ID. A warning message on the top of the editor informs you that the fully specified name is not unique. Enter a unique fully specified name and preferred term for the new concept. Hit Save, and enter a commit comment. 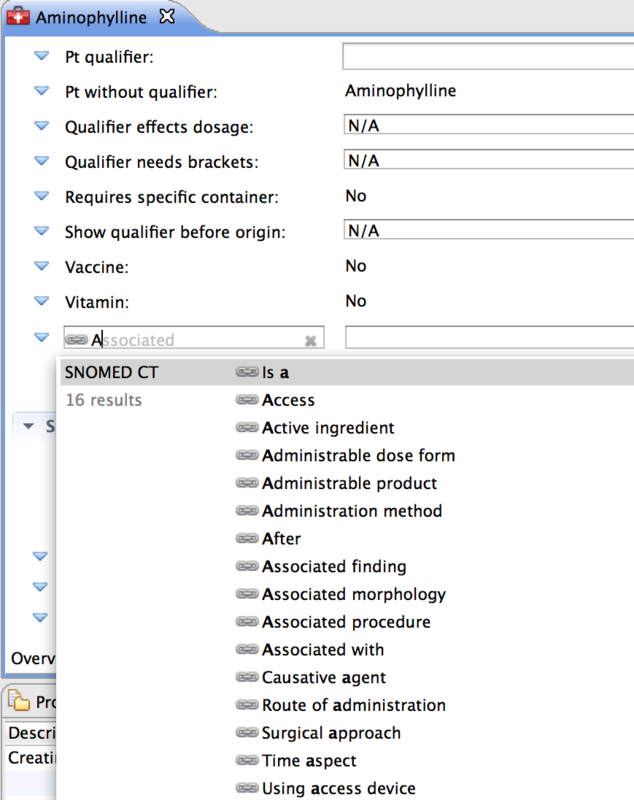 The new concept now appears in the SNOMED CT view. If you have not classified your newly added concept, it will only be visible in the stated form of the concept tree. You can toggle between the stated and the inferred view with the Authoring toggle button in the application toolbar. Adding a sibling is similar to the process of creating a child concept described in the section above. Right-click on the desired sibling concept and selecting Add new sibling concept. This action will create a new concept after selecting the Modeling method as a sibling of the selected concept. The descriptions and properties will be copied from the selected concept to the new sibling concept. An IS A relationship to the parent concept is generated as well as unique concept ID. As an example for editing a concept, we will change the description of a concept by adding a synonym. Click the add description icon to create new entry boxes in the description section. A small asterisk * next to the editor's title indicates that you have unsaved changes. An informational message appears at the top of the editor box (here: Concept contains unpublished changes), a small information symbol is also added to the top-level concept icon. Type your description type (e.g. Synonym) in the text box on the left, and your new description term (e.g. Hantavirus) in the text box to the right. The autocomplete function described in the quick search section is also available. Click the save button in the main toolbar to submit your changes the repository. Before the changes are saved, a dialog box will appear in which you may enter a comment describing your change. Once the changes have been saved, the new description appears in the editor. The box around the description term (here: Hantavirus) indicates an unpublished change. This means that the change has been saved in the repository but not been formally published yet. Once a concept has been published, only the text appears. Error, warning, and informational messages are displayed at the top of the concept editor. You can click on one of the messages to jump to this point in the concept editor. The preferred term of a concept is indicated by a rosette icon . 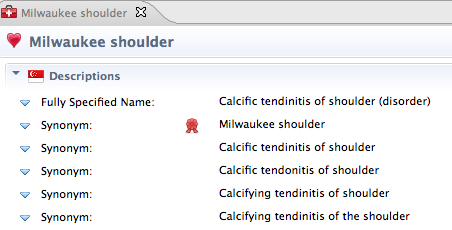 As an example, we want to change the preferred term from Calcific tendinitis of shoulder to Milwaukee shoulder. Chose Set to ... preferred from the actions. The example below shows the Singapore extension. The preferred term icon is now displayed in front of the new term . A small asterisk * next to the title indicates that you have unsaved changes. Click the save button in the main toolbar to submit your changes the repository. You may enter a comment describing your change in the dialog. The new preferred term now appears in the title of the editor. It also appears on the top of the list in the quick search. You can add new relationships on the Overview page or on the Source relationships page. When creating a new relationship an identifier is automatically generated; it conforms to IHTSDO rules and uses the namespace configured in the application preferences. The source of the relationship is the concept that you are currently editing. Relationship type and target concepts can be selected by using the search dialog. The Source relationships page is advisable for more advanced users. Relationship types that are conform with the concept model are automatically displayed in the Properties section of the Overview page. The value entry fields are empty. Click on the value field and start typing. The list shows concepts that are valid for this particular relationship type. Select a relationship value from the list. It is also possible to add a relationship that is not conform with the concept model. Click on the Add unsanctioned property button in the Properties section to create new entry fields. You might have to scroll down to see the two new fields. Enter the relationship type in the first entry field. When you start typing a list of valid values is displayed (see screenshot) from which you can select the relationship type. Enter the relationship value in the second entry field and select a concept from the list. The new relationship is now displayed on the Overview page and also on the Source relationship page. Please note that the values for Characteristic type, Union, Union group, Modifier, and Relationship negated are automatically set. You can see them if you hover over the relationship value. If you want to modify these settings, go to the Source relationship page of the editor. 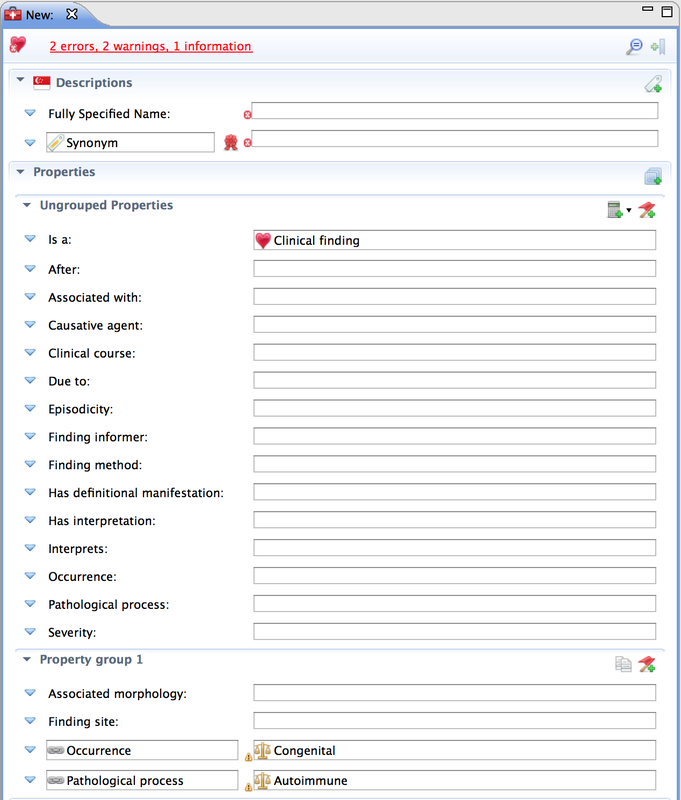 Defining relationships on the the Source relationship page is advisable for more advanced users with specific requirements since the New SNOMED CT relationship wizard allows defining any kind of relationship and modifying its settings. The values for Characteristic type, Union, Union group, Modifier, and Relationship negated can be manually modified. 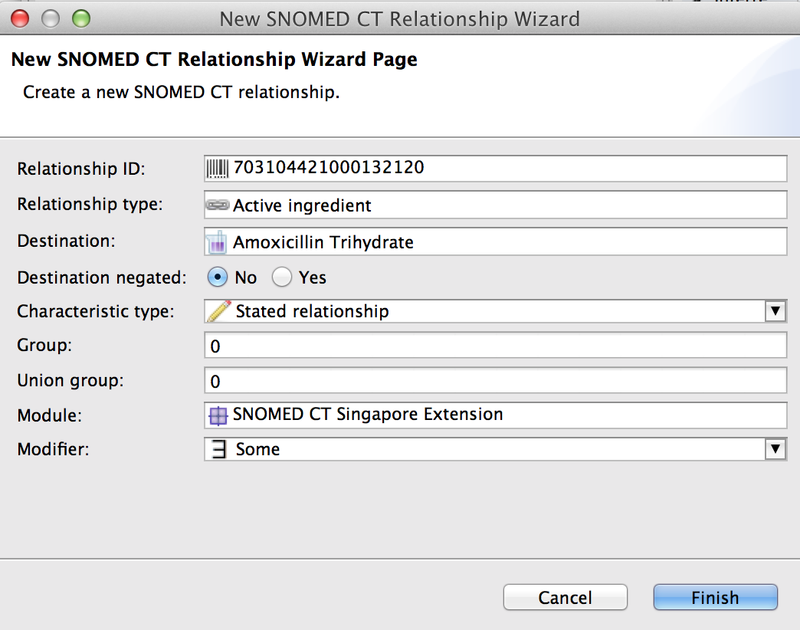 To add a new relationship from the Source relationship page you need to bring up the New SNOMED CT relationship wizard. Click on the Add new relationtionship button in the top right corner to open the wizard. You can see the new relationship ID that was created. Relationship type: Start typing in the entry field to display a list of valid values and select the relationship type. Destination: Enter the relationship value here. A quick search list of valid concepts is displayed from which you can select the relationship value. If necessary, modify the other values in the dialog. The module is configured in the application preferences and cannot be changed here. Click Finish to close the dialog. The new relationship is now displayed in the table of the Source relationship page and also on the Overview page. Descriptions can be added from the Overview page as described in the section about adding a synonym or alternatively from the Descriptions page. 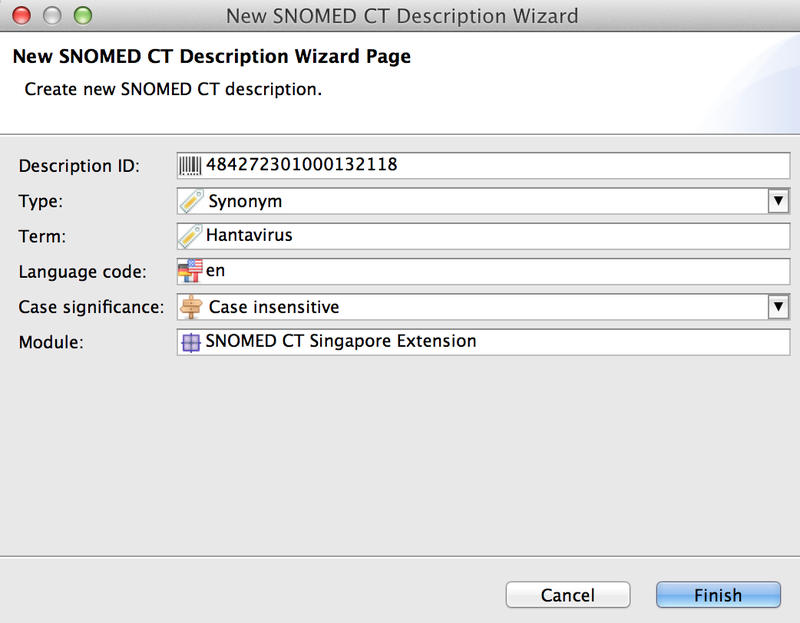 Click on the Add new description button in the topright corner of the Description page to open the New SNOMED CT Description wizard. An identifier is automatically generated; it conforms to IHTSDO rules and uses the namespace configured in the application preferences. Enter a term for your description. 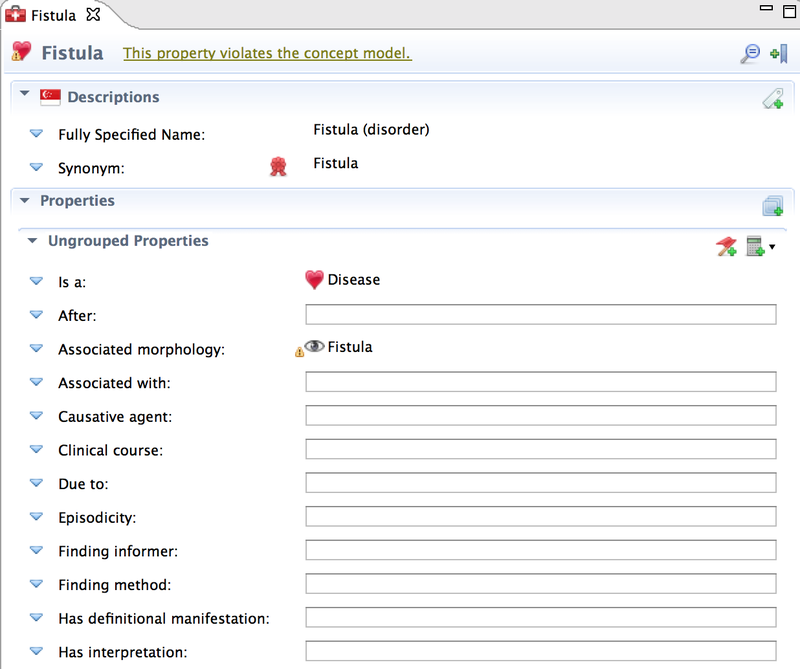 You can modify the description type, status and case significance if necessary. The values for default language and module are configured in the application preferences and cannot be changed here. Finish the wizard and save your work. The new description is now displayed in the table of the Description page and also in the Descriptions section of the Overview page. There are two options for removing newly added components: Inactivation or deletion. Inactivation will keep the component in the repository, with its status set to inactive. You can read more about the inactivation at the Editing an existing concept section. Deletion will permanently delete the component from the repository. This operation cannot be undone. When you delete a concept, all of its descriptions, source and destination relationships, children and associated reference set members are deleted as well. You can review the list of components to be deleted in a dialog before confirming the operation. Once you created a version of a component it has an associated effective time and is considered published. Hence, it can not be deleted anymore, only inactivated. You can read more about versioning here. 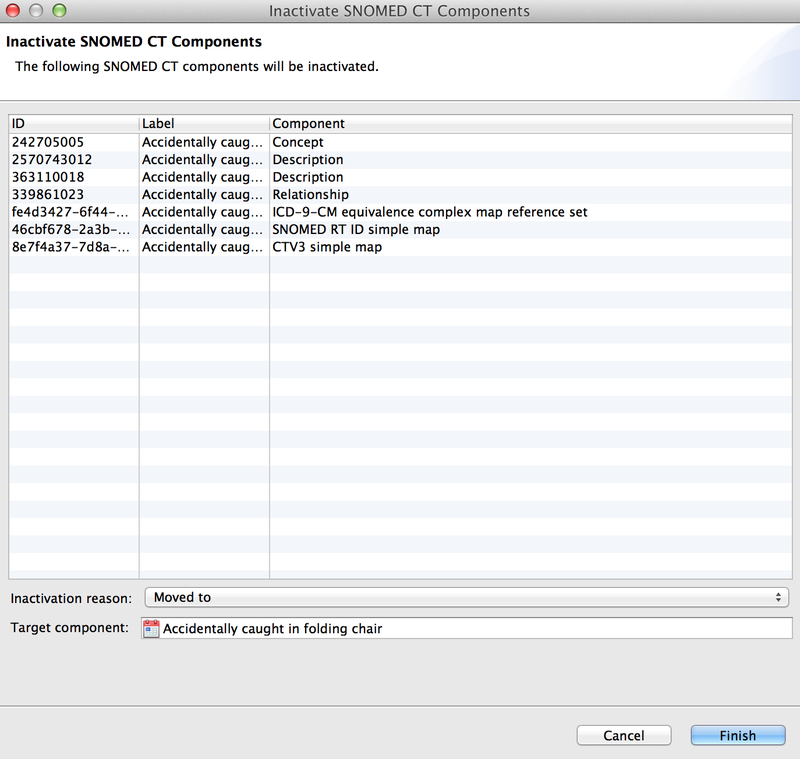 SNOMED CT view: Right-click the concept and select Inactivate concept from the context menu. It's also possible to inactivate a concept and its descendants this way. 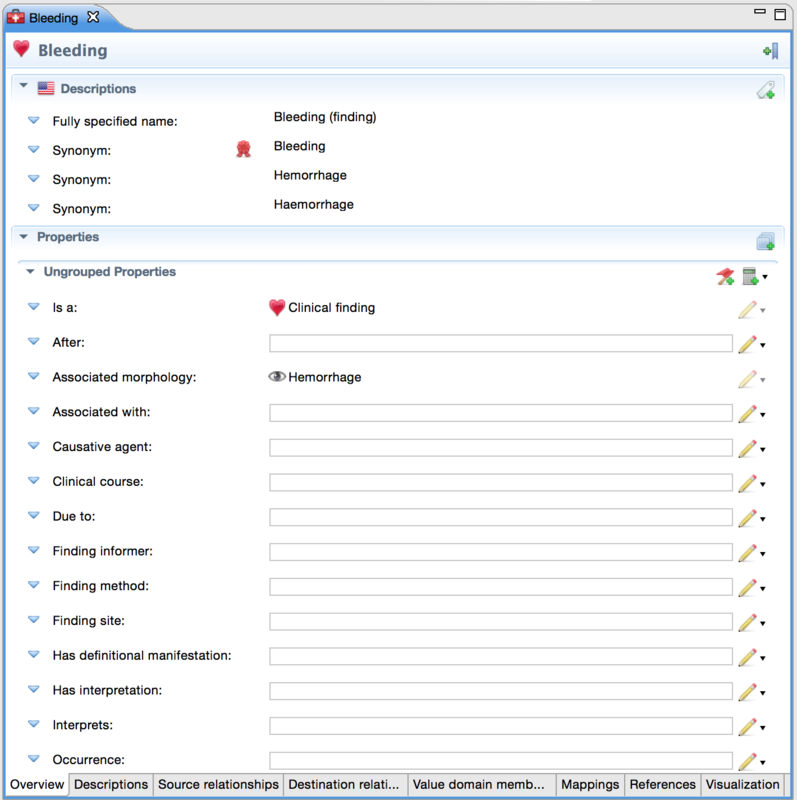 Concept editor: Open the concept in the editor and go to the SNOMED CT Properties section. Click on the blue triangle in front of status, and select Inactive concept. You can only inactivate the selected concept this way, not its descendants. The inactivation plan shows which components will be affected by the inactivation. You can also specify the reason for inactivation (e.g. moved to) and a target component (e.g. the concept that the inactivated concept was replaced by). If you return to the concept in the concept editor, you will see that the status has been changed to inactive and the effective time set to unpublished. The inactivity status and retirement target details were also updated. 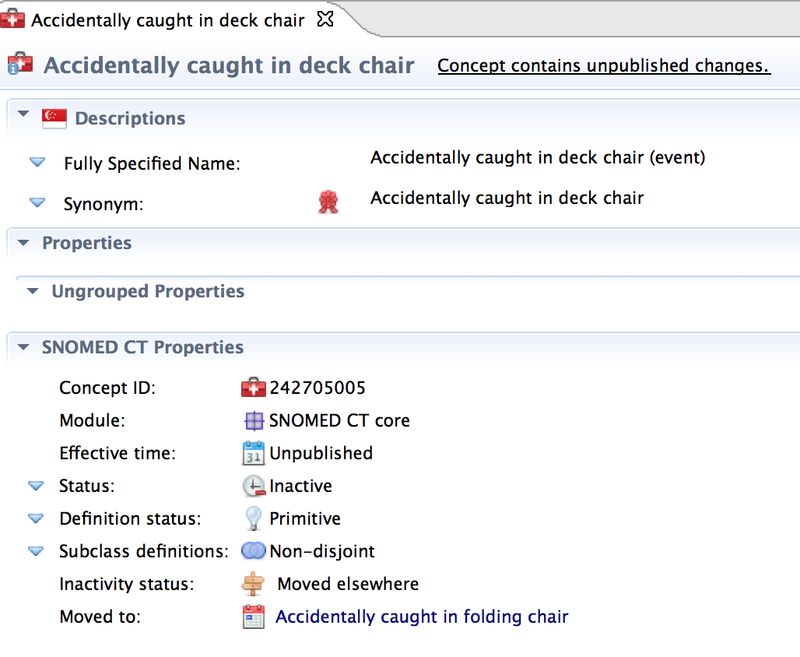 Inactive concepts are not present in the SNOMED CT view or in the quick search. To find an inactive concept you need to use the advanced search dialog and open the concept editor from the search results. 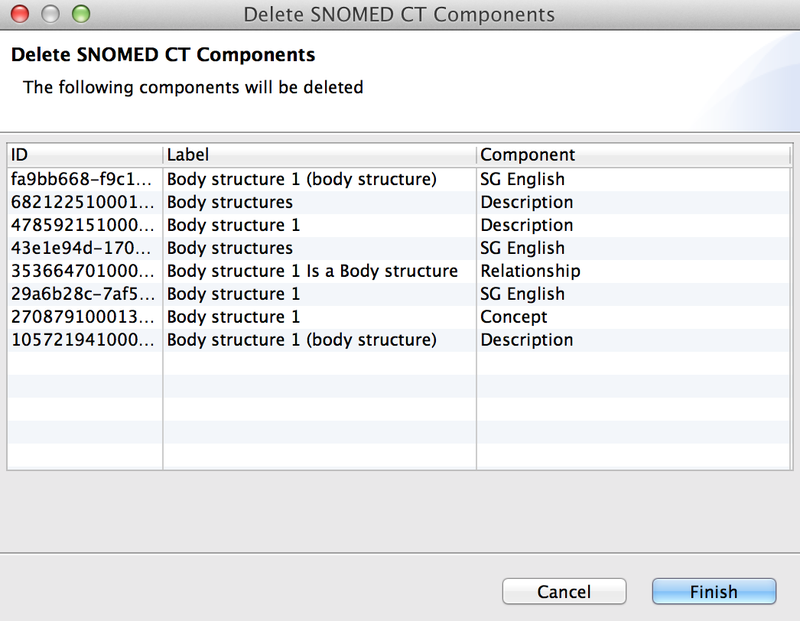 Unpublished concepts can be deleted from the SNOMED CT view or from the editor. 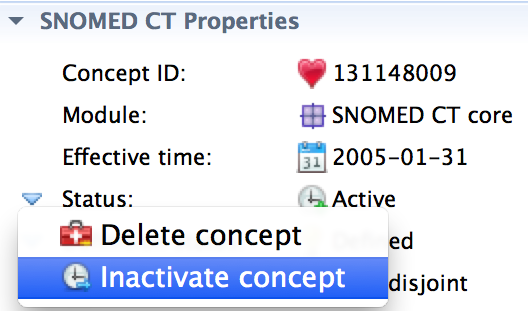 SNOMED CT view: Right-click the concept and select Delete concept from the context menu. 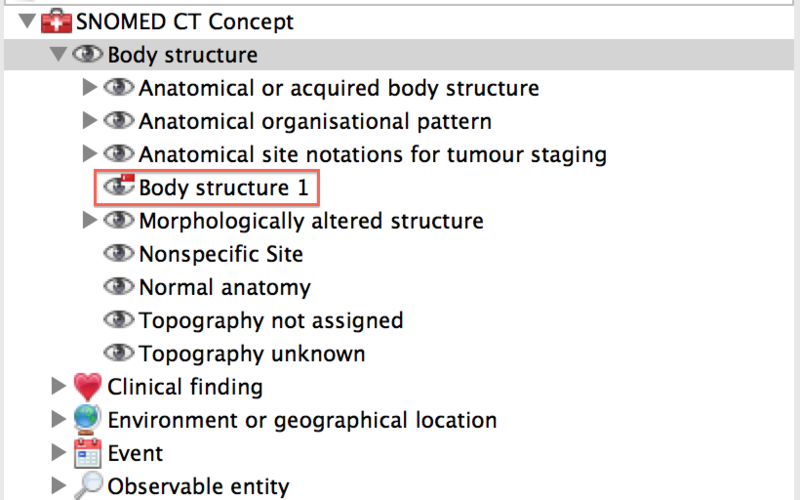 Concept editor: Open the concept in the editor and go to the SNOMED CT Properties section. Click on the blue triangle in front of status, and select Delete concept. Review the deletion plan and click finish to delete the concept. In case you are trying to delete a published concept, a message will inform you that the requested component can not be deleted. Go to the Project explorer and create a file with .scg extension. Enter the post-coordinated expression in the editor. Syntactical help from the content assist is available. The post-coordinated expressions can also be validated against the Machine Readable Concept Model to check conformance. Click Create Concept from SCG expression button. The post-coordinated expression is now added as a pre-coordinated concept to SNOMED CT. You can see the editor for the new concept. Enter the Fully specified name and the Preferred term in the editor; all the other properties for the concept and its descriptions and relationships are set to default values. Save your work. Snow Owl supports decomposing a terminology concept or a post-coordinated expression into its normal form based on the rules provided by IHTSDO. Create an .scg file in the project explorer. 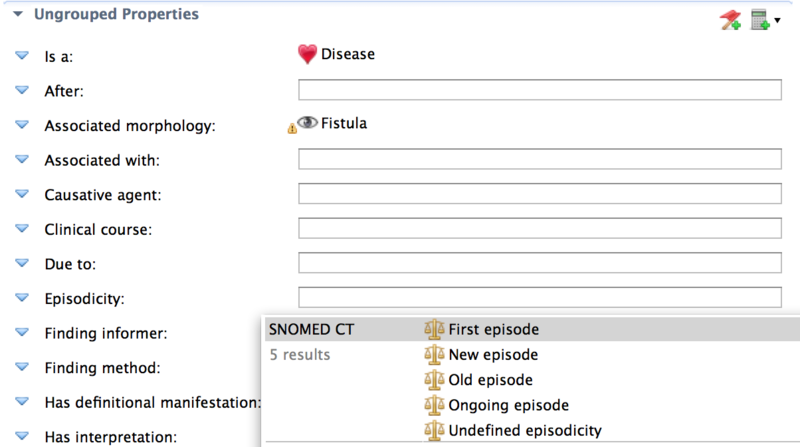 Right-click the concept in the SNOMED CT view and select Add concept to the expression editor. Your concept should now be visible in the editor. 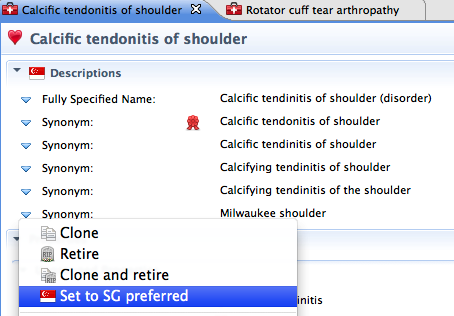 Click on the Generate normal form from SCG expression button in the toolbar. Keep the file name to overwrite the expression with its normal form, or change the file name to save the normal form separately. You can see the normal form now in the expression editor. Mark the files you want to compare in the Project explorer and right-click to bring up the context menu. 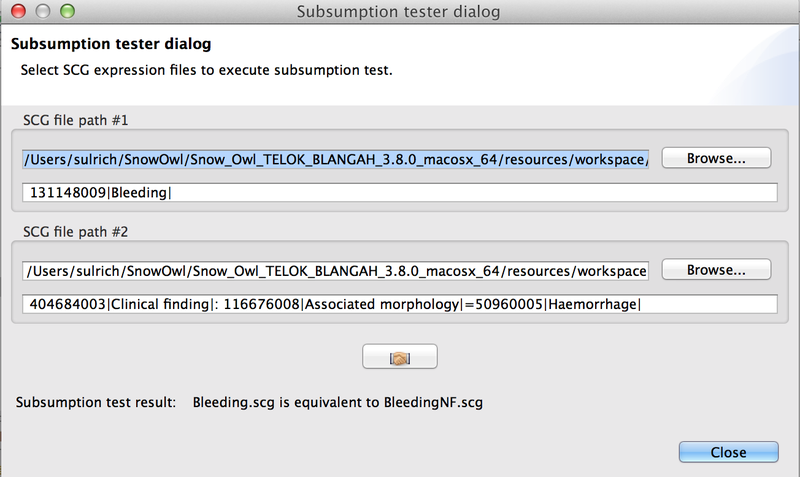 The subsumption tester dialog now displays the two files. Click Execute to start the test. The test result is displayed in the dialog.